Unicef has completed the Stormhoek Race to the Cape of Storms and crossed the finish line at 0813 UTC (1013 local time). 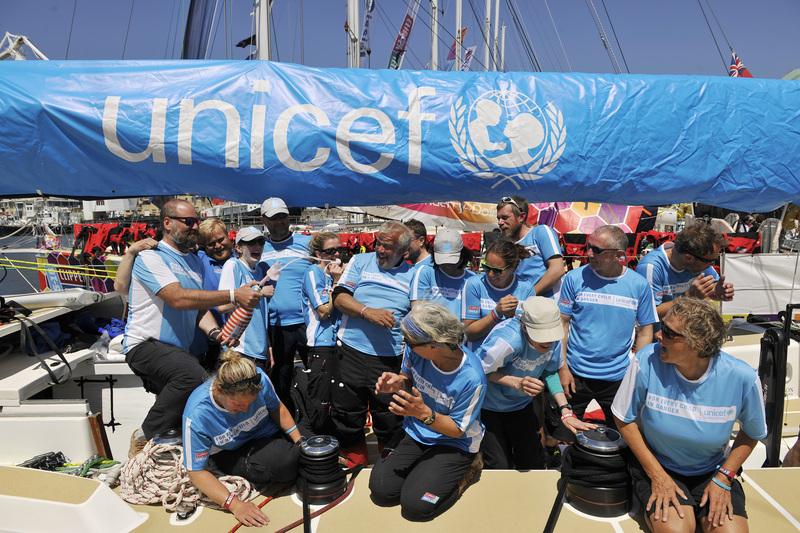 The other teams stood on the bow of their yachts giving Unicef the warmest of welcomes in the South African sunshine with Table Mountain making for a spectacular backdrop. The Cape Town stopover coincides with the South African Ocean Festival at the V&A Waterfront and Sir Robin Knox-Johnson was invited to fire a canon to greet Unicef into the marina. As the team pulled up alongside GREAT Britain and Derry~Londonderry~Doire, Skipper Jim Prendergast said: "It’s fantastic to be here and receive such a warm welcome. This is such an exciting place to be, so vibrant and with so many colours. "This race was a journey of staggering contrasts really. We started quite well and moved up through the fleet. We were about fourth I think until the three quarter mark and then a poor tactical decision sent us north when the rest of the fleet went south – when in doubt sail with the fleet – and that cost us quite badly. "Unfortunately the last three days we got caught the wrong side of a weather system and it was quite a brutal storm so we are pleased to have got through it. "We were hoping to do a little bit better in terms of placement in the leader board. But it was a very quick crossing, just over sixteen days is not bad from Rio when it’s 3,400 nautical miles. It was a good, quick journey. "I’ve never been to Cape Town before so I’m looking forward to seeing some sights, time ashore, food and uninterrupted sleep." Chloe Ford, 31, is a round the world crew member on the Unicef team. Upon arrival into Cape Town she said: "We’ve had quite a week with lots of ups and downs regarding our race position but it’s great to be here. We’ve had a brilliant arrival and a great journey in under the watchful eye of Table Mountain, it’s fantastic. "The race was a real emotional rollercoaster both in terms of positioning and the weather that we had. We went from being dead calm to being in 60 knot winds in a storm in the space of three or four days. It’s been really testing but we all pulled together and we’ve learnt a lot from it. "The morale is really good on board. We had a little dip knowing we had no wind and couldn’t come in yesterday, but we all rallied round and I think the welcome we have received here in Cape Town has really lifted everyone’s spirits. "The weather was a bit of a shock, we weren’t really expecting the big seas until reaching the Southern Ocean in Race 3 but we all worked together. Coming out of the storm was a real highlight and a sense of elation that we had got through it, I’m really proud of the team. Also waiting out in the bay here we were a bit despondent as we didn’t have any wind but the wildlife around us was so beautiful it was a real moment. "I have never been to Cape Town before and I have friends and family coming out next week so I’m looking forward to seeing the sights," Chloe added. LMAX Exchange and Qingdao are still racing. Track their progress on the Race Viewer. Their ETAs will be updated here.